Designed to go wherever you go, the Ember Travel Mug and its companion app on your iPhone or Apple Watch allow you to set your precise drinking temperature, track caffeine consumption, save presets for your favorite drinks, name your mug, and more. Or you can adjust the temperature by rotating the dial at the base of the mug. 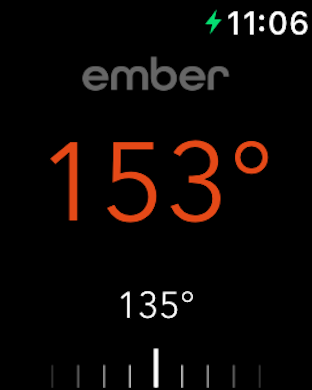 Ember also maintains your chosen temperature for approximately two hours, so your warm beverage stays perfect from the first sip to the last drop anywhere you are. Battery life : You can expect a little more than one hour when in use without the charging coaster at a target temperature of about 130°F (54.4°C). Battery life will vary depending on pour temperature, ambient temperature, and desired temperature. Charge Time : Once your Ember Mug has an empty battery, place the mug on the charging coaster for approximately 1.5 hours for a full charge. Once the LED turns green your Ember is 100% charged. 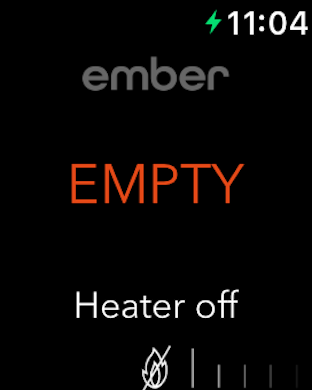 Stand By Time : If your Ember Mug is charged, not in use, and not on the charging coaster, it will go into “sleep mode” to preserve the battery.